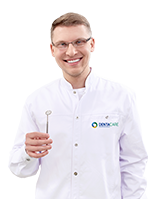 A graduate of the Medical-Dentistry Faculty at the Poznan University of Medical Sciences. She received the title of Dental Technician at the same University. She specialises in conservative dentistry. In her private life she is a happily married mother of two young daughters. In his spare time she loves to travel (both locally and globally) and keep active. She enjoys diving, skiing and watching films.